While surfing the internet this afternoon, my search engine of choice (Google), suddenly started to declare that every site I wanted to visit was unsafe. 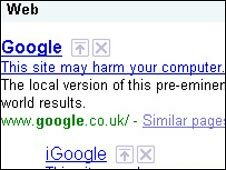 I quickly realised this was an error, as Google even declared it’s own site was harmful (see screen grab above). Now, I’ve been in IT for a very long time, I build websites in my spare time and regularly use all the major search engines for research. But what about those non-techy web users who were surfing the net today? There’s an inherent trust of sites such as Google. If Google says a site is harmful, who are we to argue? It does make me wonder how much revenue was lost today for those 40 minutes that Google declared every e-commerce site in the country harmful. Does Google have a responsibility to always provide accurate information, just like we rely on the Yellow Pages and the Phone Book to have correct details? What would we think if we opened the Phone Book one day and turned to car insurance to read all the adverts were harmful?